Since the entire country is buzzing about Winter Storm Helena, which has dropped feet of snow along the mountains of the West Coast and Rockies and is set to bring a little powder to the South and Northeast too, I figured I’d review Red Chair, a pale ale built for ski season. Dig the label, which has the Mt. Bachelor ski lift that the beer is named after. The folks at Deschutes must love that lift; not only did they name a beer after it, they hold an annual “rally” at the bottom of the lift each season, giving away beer tastings and prizes. Anyway, about the beer…There are no great surprises in Red Chair NWPA. No exotic fruit notes or layers of marzipan and pretzels. Deschutes uses some of the craft beer industry’s most well-known malts (Pale, Crystal, Munich, Carapils, Pilsner) and hops (Cascade, Centennial), but they work with these pedestrian ingredients with such precision and grace that the beer becomes a feat of true artistry. Red Chair is outstanding, even though it’s treading on common ground. Red Chair NWPA (Northwest Pale Ale) pours a dark, dark amber. Not brown, because it’s too shiny to call brown. Definitely amber. There’s a thin head that vanishes almost immediately. You get plenty of citrus on the nose, but also a little pine and what I think is peppermint—but maybe that’s all in my head because I have skiing on my brain while I’m drinking this beer. The mind can be a tricky thing, and I admit, I’m extremely susceptible to suggestion. If I’m scanning through radio stations and hit on a Hispanic channel, I immediately crave Mexican food. Everything turns to malt when you take the first sip. I get tons of caramel on the front end—so much caramel that Red Chair borders on amber ale territory. The mouthfeel is rich, smooth and round. Then things get zesty as the Centennial and Cascade Hops kick in, delivering some old school grapefruit and lemon peel notes. Once you’re past all that malty, gooey mouthfeel, the zestiness takes over and there’s just the right amount of bitterness to let you know you’re drinking a pale. The citrus is robust, but Red Chair isn’t a fruity beer by any means. The hops provide more of a floral element than anything. And damn is this thing balanced. Like, Jorge Ojeda-Guzman balanced. What’s that? You don’t know who that is? He’s the guy that lived on a tightrope in Orlando, Florida for 205 consecutive days. Yeah, this beer is like Jorge. This has to be one of the most evenly weighted beers I’ve had in a long time. 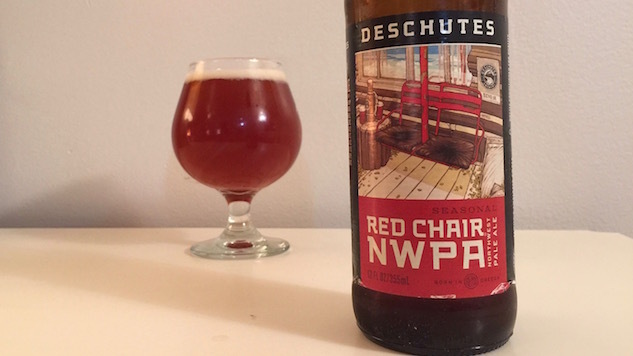 Deschutes doesn’t play any tricks with Red Chair—no gimmicks or experiments—it’s just a solid execution from beginning to end. The brewery’s year-round Mirror Pond is a fine pale, but I’d choose Red Chair in a duel any day of the week. Sadly, it’s seasonal, only available during ski season, between January and April. Drink it while you can.